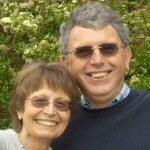 Gary & Joyce Jenkins have been involved in church leadership of various kinds over the last 20 years. Gary works part time as a management consultant and Joyce is a retired teacher. They work as a team. They have a vision of seeing society transformed by the gospel through supernatural signs & wonders…”on earth as in heaven”. Their mission – GO! – preach the Kingdom – heal the sick & cast out demons – make disciples – release people into their gifts & calling. They have two amazing sons who are both serving in local churches and two wonderful daughters in law. They also have three fantastic grandsons.